Thanks man! I think I'm going to use the respek ticket now. My build is no longer working against the bigger monsters anymore. Holy and Healing Skills updated! This is bad news for anyone who's farming stronger monsters~! Hey I should probably request for a Job quest, right? Starting today, STS and PTS will have item rewards. Following a victory, you can now roll the Rewards Dice once. Do so before 24 hours, from your first post in that STS or you won't be able to claim your reward. Also, I will no longer be accepting EARTHLING characters. If you have any concerns regarding this, please contact me. If you do decide to sell your equipment, I will replace it with a Silver tier, that is the same level as your character. This promo will end on September 1, 2016. FFMSL My Player Stats Form has been updated, please use the new form. 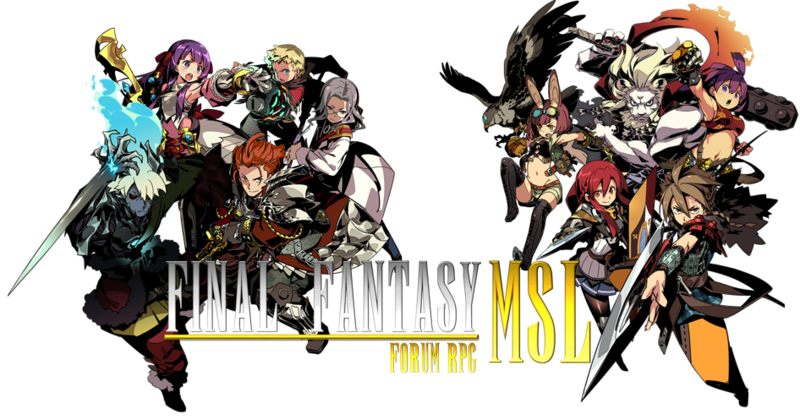 FFMSL Dual Wield System has be added. All Entry Skill of Jobs now cost 0 SP. I strongly advice that everyone sell their equipment so that you can get your updated Weapons. For those who have equipment with higher than Silver Tier, you will receive the equivalent of tier with the same upgrades or PLUS level. ...I strongly advice that everyone sell their equipment so that you can get your updated Weapons. For those who have equipment with higher than Silver Tier, you will receive the equivalent of tier with the same upgrades or PLUS level. Does the promo apply to Accessories? STS monsters level 90 and below have been weakened in response to the equipment stat drop. Wicked cool! Now what if I wanted to dual wield? If I sold my current stuff, will you give me two weapons? Actually anything is better than what I have. Yes, you'll get to two weapons if you want. Also, I've updated the MAP of Wrozan, some locations have been moved and some have been removed, others have been renamed. This is all in preparation to the coming Expansion, by Chapter 9 we should be able access certain parts of Thanatos.